liter DOHC aluminum-alloy valve 4-cylinder horizontally opposed SUBARU BOXER® engine with Active Valve Control System (AVCS). i Limited, i Touring, XT Premium and XT Touring: Not available. Lineartronic® CVT (Continuously Variable Transmission) with Adaptive. Compare 6 Trims View Local Inventory. Cargo and Storage The Forester's cargo area is quite large behind the backseat, and it expands to a very good size with the seat down. Minor exterior styling revisions Heated steering wheel now available Regular or turbo four-cylinder engine Manual transmission or CVT Forward collision prevention option. While dealers and third parties certify cars, the gold standard is an automaker-certified vehicle that provides a factory-backed warranty, often extending the original coverage. What is included in Roadside Assistance? 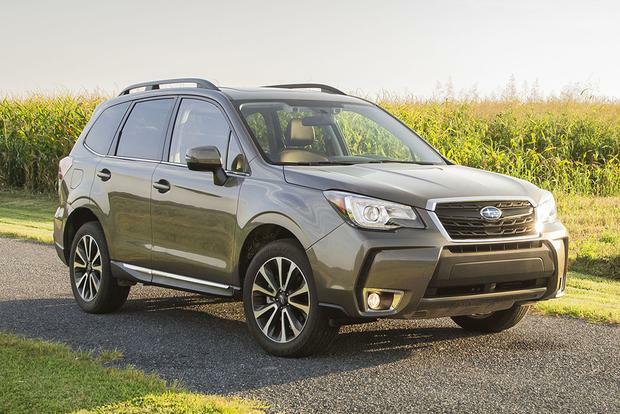 The Subaru Forester is a compact SUV that impresses us with its cargo space, visibility and peppy engine, but its shortcomings include a choppy ride, soft brakes and a drab interior. The Forester is at the head of the compact SUV class when it comes to practicality and utility, but competitors offer nicer interiors and more rewarding driving attributes. Changes are minimal for , with all Forester models getting a touch-screen multimedia system 6. A subscription-based emergency communication system is also now available. Compare the Forester with the model here. We tested a Subaru Forester 2. You can compare them all here. 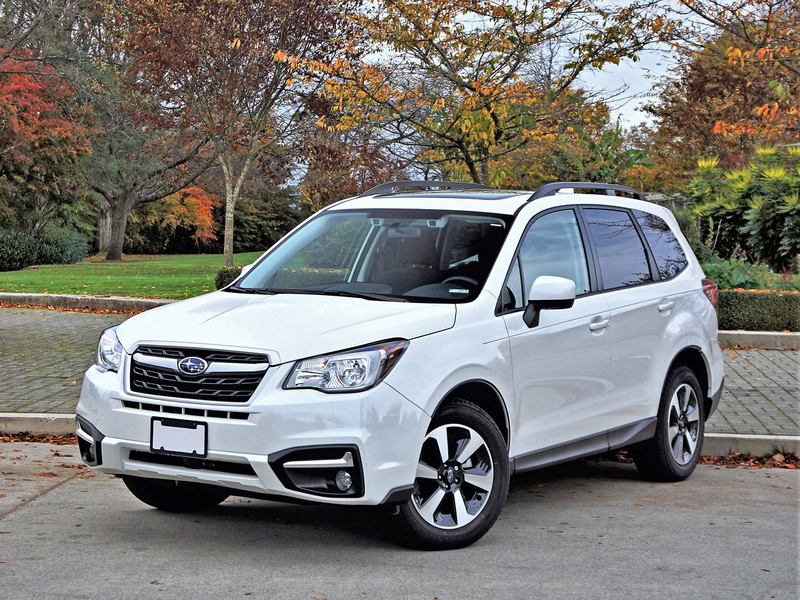 The Forester doesn't break any new ground in the styling department; Subaru stayed with the traditional, boxy SUV look. It's not ugly by any stretch of the imagination, but its distinguishing characteristic is that - at least to my eyes - the wheels appear too small for the body. The Forester offers good acceleration from a stop and power is generally good across the range. The Forester uses a continuously variable automatic transmission, and its immediate response makes it one of the better ones on the market. I find the Rogue's CVT I find the Rogue's CVT to be disappointing in its weird, elastic response. Wind and road noise aren't so bad, but there's more engine noise in the Forester than its competitors. Stopping with confidence isn't really the Forester's strong suit, either. It has a very soft, mushy brake pedal. Ride comfort is a mixed bag. It just feels choppy. The CR-V again leads the category in this area, and I'd put the Rogue second, the Forester third and the sporty, rough-riding CX-5 last in terms of ride comfort. When it comes to handling, the Forester is surprisingly capable and willing to be pushed, but it's let down both by its mushy brakes and by its steering. The Forester's steering simply gets too light at higher speeds, so it doesn't offer enough feedback to inspire confidence. 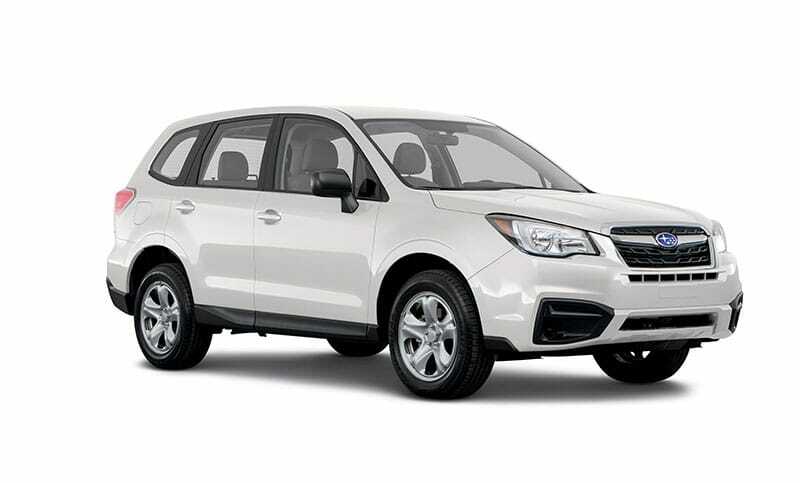 Unlike the Forester, which has standard all-wheel drive, those other models also offer front-wheel drive, which boosts the Honda's combined rating by 2 mpg and the Mazda's by 3 mpg. The FWD Rogue's city and highway figures are both 1 mpg higher, but its combined rating is unchanged. In addition, there are two other powertrains available in the Forester: The Forester's standout attribute on the inside is its phenomenally good visibility. This is an SUV, so you ride higher than you would in a car, but the great view is also due to the fact that there's a lot of glass. The main windows are large, and there are also small, sail-shaped windows by the side mirrors that help visibility. The rear window was so large, in fact, that I was startled at first by how much I could see. It's head-and-shoulders better in this regard than any competitor. The Forester is also roomy. I'm 6-foot, 2-inches tall, and I wasn't cramped for space either in the front or in the backseat. There's one piece of trim by the driver's right knee that I think could use some padding; when I brushed up against it, it didn't feel great. The seats weren't my favorites, either, as they offered little thigh support and are designed such that I felt I was perched on top of the seat rather than being supported by it.